Marie Kennedy and her husband Mark Cockerill (pictured left) moved to Washington in 2003, following 30 years in San Francisco, and became Seattle Opera donors the following year. They've been great supporters of the company ever since, and the two recently joined us for a special tour of Seattle Opera's Scenic Studios in Renton. The Scenic Studios boasts a talented, passionate staff that builds sets for Seattle Opera productions and also takes on many non-Opera projects--like building the "Making of Avatar" exhibit that was recently shown at EMP|SFM, doors for Seattle's iconic monorail, and sets for other theater companies. 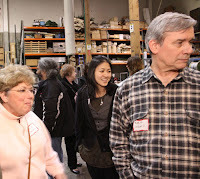 Marie is our guest blogger today, and she shares what she learned on the tour. We started our evening by checking in and getting our choice of wonderful gourmet sandwich boxes and drinks before boarding the bus for the ride to the Scenic Studios. During check-in we received color-coded name badges so that we could be split into three manageable groups for the scene shop tour. There was lots of rousing and interesting conversation, along with a tasty dinner, during the bus ride—which actually went pretty fast considering that we were in the heart of rush-hour traffic. Upon arrival, we were welcomed by Michael Moore, the Scenic Studios Manager. Michael explained that leaders of the three elements of creating scenery would be giving presentations on design, construction, and scenic arts. He said they were just finishing up the scenes and props for the upcoming Young Artists Program presentation of Don Pasquale and that we would be discussing elements from the recent production of Orphée et Eurydice, as well. Dave Crouse (left) speaks to the tour group. We were in the “red” group and our first presentation was about design, and given by Dave Crouse, the Assistant Technical Director. We first looked at drawings and photos that would be used for the backdrop of Don Pasquale and Dave explained how these designs would be projected onto very large and long blinds. He also explained that using projections allows for a very cost-effective process which is a top consideration for the Young Artists Programs. We got to see how the design process progressed from small drawings to large-scale computer-aided-design layouts. Dave’s next topic was some of the backdrop for the Orphée production and the folks in our group were very interested in how the designer came up with the idea for the large tree used in Act I. We saw photographs of a dead tree that were taken somewhere in Africa, and it was from those photographs the detailed design for the on-stage tree was created. Each person in our group then received a sample of the artificial grass from the Orphée production that was mounted on a small wooden board. These handouts have become collectors’ items; in previous tours, we received samples of the dragon skin from the Ring as well as blue sky fabric from Amelia. 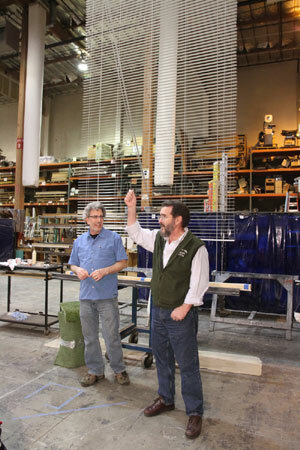 Bruce Warshaw and Michael Moore give a demonstration, using the blinds from Don Pasquale. 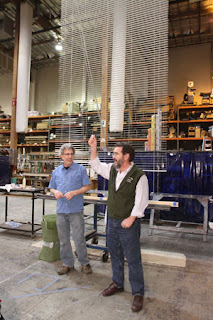 Our next presentation was about construction, and given by Bruce Warshaw, who is the Master Scenic Carpenter. Bruce explained that in addition to carpentry, his expertise also includes metal work, such as working with steel beams and steel supporting structures for the scenery. Bruce explained that his area receives the design documents and they are tasked with determining the best way to build the scenery, whether from wood or metal or other materials. We first got to look at the large blinds that are being used as the projection backdrops for the YAP Don Pasquale production. The blinds are 20 feet high and work just like blinds that we use in our homes, but because they had to be 20 feet high, they needed to have special metal reinforcement in the head-rails. Another technical glitch that had to be overcome was that standard blind slats have lots of holes in them for normal blind operation and this wouldn’t work for the production because it would mean light would shine through during the performance, spoiling the projections. So Bruce’s team had to order solid slats and then drill only a couple of tiny holes in each slat so the blinds could be opened and closed properly. As I recall, there were hundreds of slats that had to be drilled and then hand inserted into the little strings that control the blinds. It was amazing to hear about the level of detail that these folks go through to ensure a seamless production. Bruce Warshaw shows the tour group the grass used in Orphée et Eurydice. We then moved onto a discussion of the grass mounds that were built for the Elysian Fields in the Orphée production. We got to look at detailed design drawings for the steel and wood structures and learned how each section of grass had to support a certain amount of weight because several dancers and performers would be running up and down these structures. 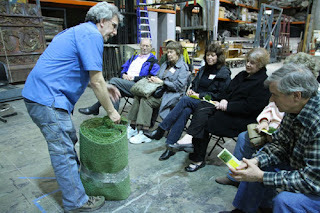 We also learned about the artificial grass and saw it in a large roll, and learned how it had to be attached to the supporting structures and then how all of the structures were held together on stage. 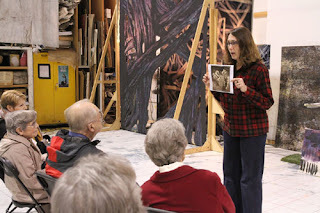 Our third and final presentation was by Kitty Kavanaugh, Master Scenic Artist, who spoke to us about scenic arts. As we sat down to hear Kitty’s presentation, one of the artists on her team was finishing up the painting of a large Picasso reproduction that was going to be used in Don Pasquale. 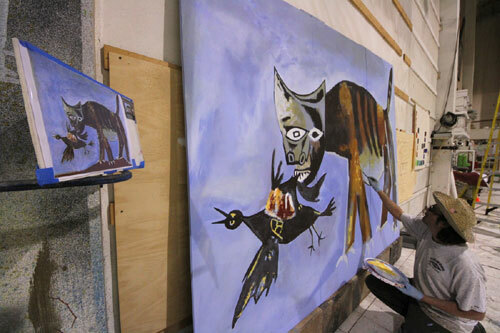 A reproduction of a Picasso painting, for the current Young Artists Program production of Don Pasquale. We then moved onto discussion of the scenery from Orphée and we focused on the large ball of roots that was used in the second act. Kitty explained how the root ball, which looked three dimensional during the production, was actually painted and since it was on velour, they were able to create a three dimensional look. She also showed us the tools they used to paint the stage surface for Orphée and explained how the paint had to hold up with people walking and bicycling on it. Kitty showed us samples of different materials that were used in the backdrop of the Furies segment of Orphée, where the backdrop was a webbing of light-colored crisscrossing lines or bones on a dark backdrop. Here again, the painting on velour gave a very three-dimensional look that was eerie and perfectly appropriate for that scene. We had lots of good questions and discussion within our group and we hated to leave. Kitty Kavanaugh explains the inspiration for Act II of Orphée et Eurydice. As we all got ready to board the bus for the return ride home, Michael Moore held a large section of the special curtain that was first used in Ring 2009. 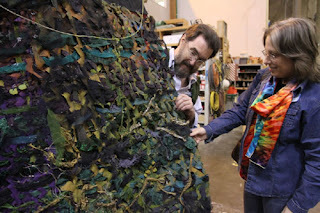 We all got to see close-up and feel all of the different types of fabric that were woven to create the curtain. Michael explained how the curtain was created at the Scenic Studios with weavers crawling on the floor to create that masterpiece. Michael Moore shows a guest the curtain developed for the Ring in 2009. We boarded the bus for the drive back to the Opera offices. 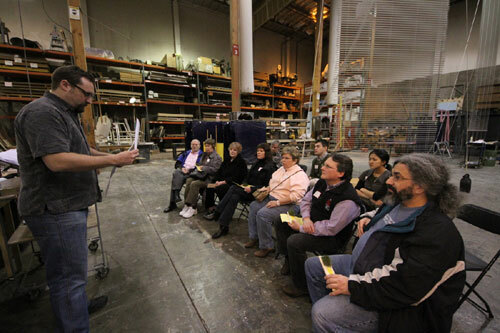 Again there was lots of rousing and interesting conversation as folks discussed their impression of all the wonderful presentations by the folks at the Scenic Studios. It was a wonderful evening—one of the best—and everyone looked tired and happy as we walked to our cars to drive home. A terrific time was had by all. So synthetic grass was being used at "Orphée et Eurydice". I never thought that even opera's like this one uses synthetic grasses. I've asked someone with an expertise of doing landscaping in perth recently. What I asked him to do is a landscape with a theme of this opera. I wish I had an opportunity to watch this. I really wanted to learn more about landscaping because I needed to do ours by myself. For now, I called up landscapers. Maybe next time, I'll do it on my own! Me too! I do wish there are more seminars like this, because I want to design our whole backyard garden for my mom. I want to put up bricks there and make a dreamlike garden look, with vines and flowers flowing from their hanging vases. I can imagine it would be lovely! Thanks for this, I hope you can update us about more seminars! I love all things about theatre, and it’s my dream to take a tour of its studios and experience the production offstage. In fact, I am also thinking to remodel my room and make it theatre inspired, I think that would be a brilliant idea! I love the new color! I have a similar color in my bedroom and I just love it! Everyone says it's so calming, and I'm sure your living room will feel the same. The sectional and curtains look great against the blue. Can't wait to see the room with art!